This entry was posted in musing, Musings, Personal, Weird stuff by Alice. Bookmark the permalink. Love ghost stories, and I like your new look. Very classy. Thanks, Ruthe. I got the idea from your new look. I had planned to replace the default photographs with my own but I decided I rather liked the idea of vacating that “wintry” landscape for awhile. Either I’m getting very lazy or it works very well for the theme. Flowers were on my list for today but it’s been raining, so I took a nap instead. I trust that nap was on a chaise lounge on that new screened-in porch. Yesterday it rained here, so like a gentle Florida spring rain, I was almost transported to another time, another place. Oops! Happy Birthday to You! Thanks. I just feel lucky to still be kicking these day, and try not to think of birthdays in terms of numbers. Another day passed, another day older. Belated Birthday Greetings, Alice. It is good to see you back with a fresh new look. May your plants flourish with an abundance of colour to welcome all who come to your door. Our paths crossed it seems. I’m really crossing my fingers and hope I don’t kill any by either over- or under-caring for them. Winter’s been especially hard on us all this year, and we’re really craving flowers in a big way. Thanks for the b’day wishes! How truly delightful to find that you have written again. I have missed you. 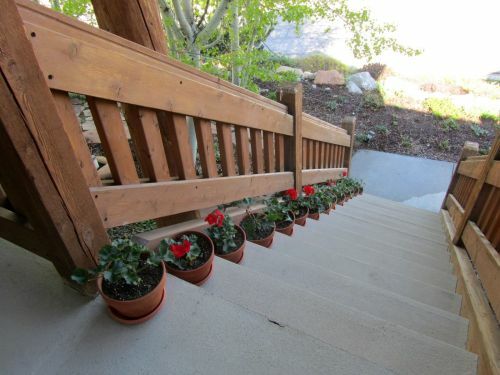 Love the flowers marching down your stairs too. Nice images all around. Hey, glad you are back writing. Was going to call, but, you know how it is – time flies. Great writing as usual – and I like the new style. Adrienne! I’ve been thinking of you, how it’s been so long since we were in Las Vegas but you’re right how time flies by. We’re plugging along here trying to stay active. I haven’t exactly divorced blogging, I’m just making it a point to spend less time online. Stay cool!